If you've been anywhere near the digital marketing scene in the past few years, you've heard about native advertising. Native ads look and feel like the content on their source's platform, so they're less disruptive than traditional ads. Given the native ad fervor these days, becoming your agency's go-to expert is a smart move to make. Here are four ways you can become a sought-after native advertising resource. To pitch clients on native ads, you need to understand two twin trends: the failure of traditional digital advertising and the simultaneous rise of interactive, nondisruptive forms of marketing. Users aren't clicking on display ads like they used to, and in this environment, less-intrusive native ads excel. 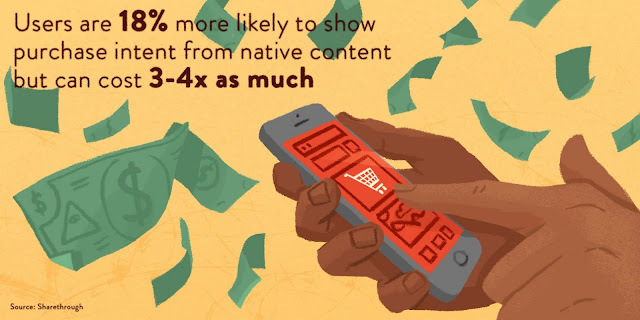 Fifty-three percent of users prefer looking at native ads over banner ads, and users are 18 percent more likely to show purchase intent from native content, according to Sharethrough. Native formats also play well across devices, a key advantage in our mobile-driven world. Arming yourself with the latest knowledge on native advertising will help you know how to succeed with your clients. An easy way to increase your native advertising knowledge is to keep tabs on what publishers and brands are creating. Major publishers have social media accounts dedicated to their branded content: Check out the New York Times' T Brand Studio, Huffington Post's Partner Studio, and Forbes's BrandVoice to get a feel for how brands are using native content in the wild. The FTC is watching native content, and marketers need to understand disclosure guidelines to avoid FTC ire. Disclosures should be readily visible, and the FTC prefers explicit terms like "paid advertisement" versus "promoted story." Still, terms like "presented by" or "sponsored by" aren't necessarily prohibited; it all depends on whether consumers can be deceived by such language. (You'll notice plenty of "sponsored" posts on Facebook, for example.) Marketers can keep up-to-date by following the FTC's business blog and reading the native ad guidelines, which include disclosure examples. Another big advantage of native is the ability to target users. When working with clients, you need to hone in on narrow audience subsets and then consider the publisher, content type, and story that will resonate most. Developing buyer personas—or tweaking existing personas to fit your native advertising campaign—is a must. Once you understand your audience and where they live online, you're ready to consider potential publishers. Remember that research is key. Is the publisher able to target a segmented audience, if desired? How will the publisher promote your native content? What actions will readers be able to take? For example, if you're Hampton Inn, you're probably not aiming for retired vacationers with a nifty Buzzfeed quiz like "Can We Guess the Music You Like Based On Your Ideal Vacation?" You will, however, likely score big with millennials. Knowing whom you want to reach, understanding which platform will work best, and creating compelling content will unlock your native advertising potential. Native ads can be more effective, but also more costly. Native content isn't a marketing holy grail. These ads can be expensive and tricky to measure. Often native ads are bespoke creations involving significant back-and-forth between the publisher and brand. The Orange Is the New Black native ad in the New York Times is one example—interactive and unique, but also likely incredibly expensive. In fact, The Information notes that a native ad on a popular site can cost up to three to four times as much as a banner ad on a top-tier site. Choosing your campaign and where to publish are therefore of utmost importance if you want to get the most bang for your buck. Moreover, marketers still haven't determined which native metrics to track and why, the Wall Street Journal reports. Click-throughs are one metric, but what about other factors? Did brand recognition increase? Were leads generated? Was content shared? Marketers need to be flexible: For different clients and campaigns, measurement and tracking will likely differ, too. Make sure that when you're measuring a campaign's success that you're considering the most appropriate metrics. Native checks a lot of boxes—it breaks through the proverbial clutter, it reaches a targeted audience, and it engages banner-blind users. By growing your expertise, you can help your clients—and others at your agency—better understand native advertising's benefits and recommend effective strategies. 1. Native advertising offers significant potential as an effective marketing tactic. 2. With native ads on the rise, those who understand the opportunity will become valuable agency resources. 3. Native advertising offers many advantages, but it's not an automatic A.